These matching 14k real white gold spiral heart studs are made from genuine real 14k solid white gold wire and ear backs just for a mother and daughter. 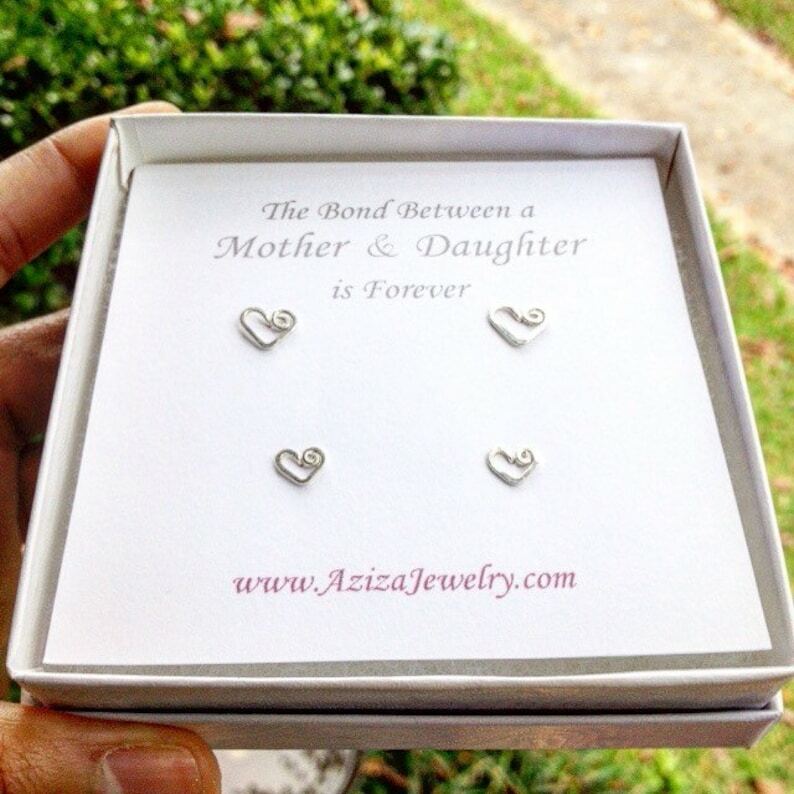 The bond between a mother and daughter is so special and this set makes it even more so with this matching handmade pair of hearts. You will receive 2 sets of studs. The larger pair measures about 1/4 inch wide and the smaller pair measures around 3/16 inch wide. Perfect way to show your love for your daughter or mother. She will always have a piece of your heart. The model is wearing the larger pair. *Please note: white gold does contain nickel*. Have questions? Concerns? I'd love to chat with you! This add on includes a box with bowtie and *when* gift message is included, it is added to one of my small handmade cards. Mother Daughter 14k Solid Gold Heart Studs Set. 2 Pairs Solid Gold Heart Studs Set in Medium and Small. Mother Daughter Earrings. Everything about the experience was great, from the final product to the quick response to a change I needed to make in the order. Would definitely use this seller again and would highly recommend! Thank you for your excellent service. The bracelet is perfect !! Fast service Fast delivery and Great customer service. Rainbow Bracelet. Boho Chic Rainbow Genuine Gemstones Gold Bracelet. Rainbow Colorful Gemstones and Gold Bali Beads Bracelet. Payment is accepted online by credit card through Etsy or via PayPal. Repairs can be paid by check that is sent with the piece which is to be repaired. Items paid by check will be made and/or repaired after the check has cleared. For special or custom orders, payment is expected prior to items being made or shipped. Contact me for my payment address to arrange for check payment. I strive to make well crafted beautiful jewelry and I want your shopping experience with me to be amazing. If you receive an item that was damaged in transit to you, please message me as soon as you receive it so I can replace it. I am happy to accept returns of a well packed item received in the same condition as it was shipped if it arrives damaged. If you receive an item that is fine (nothing broken) and you just no longer want it, I do accept item returns and exchanges for a non-custom made item. Custom made items are non refundable. 14k Solid Gold Items are all custom made as you order them and are non-refundable. If you purchase a custom name necklace or a personalized order of any kind, I will be unable to refund the item unless it arrives broken or is defective in some way. If there are ANY questions whatsoever, please message me before purchasing! The customer is responsible for all return shipping costs. In the event that an item arrives damaged, or broken, you must contact me as soon as it is received. I am more than happy to refund your purchase price upon the safe confirmed return of the damaged item. For all returns, and exchanges, shipping your item with delivery confirmation (tracking) is highly recommended in order to confirm the safe return of the item. If delivery confirmation or tracking is not used, and I do not receive the returned item, there is no way to confirm that you have in fact shipped the item back and I will not be able to refund it. Please send your item back in a bubble padded envelope or small box for safety. Refunds and exchanges must be approved before you send the item back so please do email me before sending an item back. Returns must be made within 14 days of receiving the item. I ship to the US and Internationally to a confirmed Shipping Address. If an incorrect shipping address is given to me, you will still be responsible for the shipping fee if the item gets returned back to me and if you would like it to be re-shipped to you. I cannot be responsible for an items that were shipped to an incorrect shipping address that the customer provides. Standard shipping in the US is via USPS First Class Mail which can take up to 10 business days. USPS Priority Mail can be purchased as an upgrade (2-5 business days). Standard International mail is sent via USPS First Class Mail. International Delivery can take anywhere from 4 days to about 4 weeks to arrive. Allow even more time around the holidays and if your item has to pass through your local customs. For Shipping Upgrades within the US, specifically RUSH Priority Mail and Express Mail (1-2 days), items will be made and shipped within 24 hours (business days only) and shipping includes a rush fee to expedite your order. If for some reason shipping is substantially delayed by the Post Office and it doesn't arrive within the expected delivery date, you may request a refund for the shipping fee, however the RUSH FEE IS NON-REFUNDABLE. Every purchase within the US automatically includes delivery confirmation (tracking). International orders shipped via standard shipping do not include delivery confirmation (tracking). If you wish to track international orders, you will need to purchase the Upgraded International shipping option. If you would like to purchase insurance for International orders please email me prior to purchase for a price estimate to your destination. International Shipping Upgrades (6-10 days) is just an estimate and cannot be guaranteed because items can be held in Customs for several days which is completely out of my control. For international orders, you, the purchaser, are responsible for all tariff and duty fees that your country may impose in order for you to receive your package. Your package is valued at the total amount stated on your invoice. Tracking is only possible outside of the US if you select upgraded shipping at checkout. Tracking is not insurance, which must be purchased separately. Please contact me for additional shipping insurance price quotes. For wholesale inquiries, please message me. I am happy to discuss production times and minimum order requirements. I currently sell wholesale within the US and Internationally and I am happy to take requests on custom orders and exclusive pieces within the US and internationally. I am also happy to discuss limited short term consignment agreements within the US only. Currently my jewelry is sold currently online, and in several stores within the US. If you are a store who is interested in carrying my jewelry within the US or internationally, please convo or email me! I also have an etsy wholesale account. Sisters Gold Heart Studs Set. 2 Pairs 14k Gold Filled Heart Studs Earrings Set in Medium and Small. Matching Mother Daughter Heart Necklace Set and Earring Set. Gold and Silver Mommy Daughter Necklaces. Matching Heart Necklace Set. Gold Mother Daughter Earrings. Gold Heart Key Studs Earrings. Gold Heart Key Posts. New Mom Jewelry Earring Gift Set. Push Present. Matching Mother Daughter Necklaces. Sterling Silver Mommy Necklace and Heart Necklace Set. Heart Necklace. Valentine's Day Push Present.